Italy has one or more special sweets for every holiday. For Christmas, it’s panettone (a leavened cake with canditi – candied fruit – and raisins) and pandoro (a yellow cake cooked in a tall, star-shaped mold). At Carnevale, it’s tortelli and chiacchere. Tortelli are fried, hollow balls of pastry, sometimes filled with cream, chocolate, etc. Chiacchere (literally, “chatter”) are deep-fried crackery things, liberally dusted with powdered sugar. These very fattening items were meant to be a sweet indulgence before the privations of the Lenten season, but nowadays, for the weight-conscious, oven-baked chiacchere are widely available. My favorite seasonal sweet is coming up soon, for Easter: the colomba, a dove-shaped cake (as the name implies), similar to panettone but, instead of canditi and raisins incorporated into the batter, it features a cracked glaze topping with sugar grains and almonds. Easter also means chocolate easter eggs. These are commonly about a foot tall and hollow, with a “treat” of some kind rattling around inside – sometimes more chocolate, but often a trinket or toy or, in the expensive versions, a piece of jewelry. There are plenty of crass commercial eggs available, themed with the latest kids’ obsession (yes, I am trying to find “Eggolas” for my daughter). 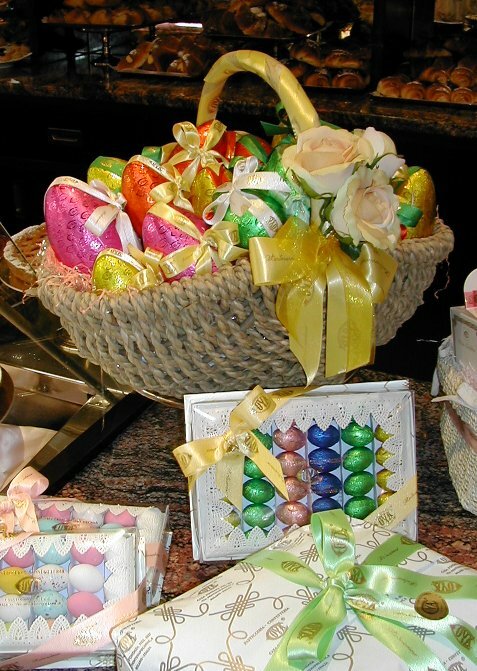 But the best eggs are generally hand-made at your local pasticceria (bakery) from good-quality chocolate. Sometimes they are elaborately decorated with hard icing, but most often they are wrapped in pretty paper and decorated with frothy ribbons, flowers, etc. The bakery eggs also have treats inside but, to me, the treat is on the outside. Break off shards of a good-quality dark chocolate egg for the perfect accompaniment to a really good colomba. This entry was posted in Italian food and tagged Italian food, Italian holidays on March 19, 2004 by Deirdre Straughan.